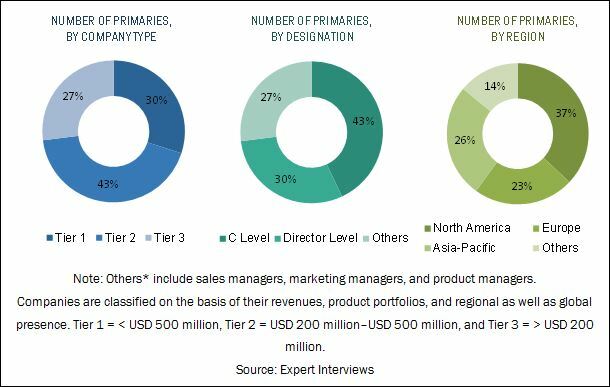 [180 Pages Report] The lubricants market is estimated to have accounted for USD 144.45 billion in 2015 and is projected to reach USD 166.59 billion by 2021, registering a CAGR of 2.4% between 2016 and 2021. Lubricants are materials that help reduce the friction between moving parts or surfaces to enhance the efficiency of machines. They are used in different applications ranging from automobiles to large multitudes of industries. In this report, 2015 is considered as the base year and forecast period is between 2016 and 2021. The increasing sales of passenger and commercial vehicles in Asia-Pacific is driving the automotive lubricants market. The motorization rate is increasing in the past five years in Asia-Pacific region. This can be attributed to the increasing disposable income of the people and industrial growth in the region. The key countries contributing to the growth in this region include China, India, Japan, and Indonesia. India was the sixth largest motor vehicle/ car producer in the world in 2013. This technical, market-oriented, and commercial research study of the global lubricants market involves the extensive use of secondary sources, directories, and databases (such as Hoovers, Bloomberg BusinessWeek, and Factiva), to identify and collect information. The primary sources mainly include several industry experts from core and related industries and preferred suppliers, manufacturers, distributors, service providers, and organizations related to all segments of the industry’s supply chain. After arriving at the overall market size, the total market has been split into several segments. The figure below illustrates the breakdown of the primary interviews based on company type, designation, and region conducted during the research study. The value chain of lubricants include raw material manufacturing companies such as ExxonMobil Corporation (U.S.), Royal Dutch Shell Plc. (Netherlands), BP p.l.c. (U.K.), and others. These companies are vertically integrated, they produce raw material i.e. crude oil and use it for the production of various lubricants. However, the other companies are engaged in the production of lubricants using crude oil and additives that are provided by raw material suppliers. After the completion of the production process, lubricants are distributed in the market through different channels. The blending plants supply their products to distributors, which are further distributed among, retailers, independent workshops, and garages. The major applications of lubricants are transportation and Industrial machinery & equipment. In January 2016, Total S.A. (France) acquired the Dominican fuel, retail company from Putney Capital Management (Caribbean). The deal contains a well-recognized network of 130 stations beside the sale of vital commercial lubricants and oil. This report categorizes the global market for lubricants on the basis of type, application, and region. The global lubricants market is projected to reach USD 166.59 billion by 2021, registering a CAGR of 2.4% between 2016 and 2021. This rapid growth in the automotive industry in Asia-Pacific is a key driver of the lubricants market. The rapid growth of various manufacturing industry in emerging nations is one of the drivers of the market. Lubricants are materials that help reduce the friction between moving parts or surfaces to enhance the efficiency of machines. As friction causes heat, lubricants reduce the heat by carrying it away from moving surfaces of machinery and cool its components. Lubricants also prevent rusting and corrosion of moving parts in machinery. They are used in different applications ranging from automobiles to large multitudes of industries. The lubricants market is classified on the basis of type, namely, mineral oil lubricants, synthetic lubricants, bio-based lubricants, and greases. The lubricants market is dominated by mineral oil lubricants because of its low cost and easy availability. However, owing to the increasing government regulations and consumer awareness, synthetic lubricants and bio-based lubricants are projected to register a high CAGR during the forecast period. Greases due to its high use in various manufacturing industries registered the highest CAGR between 2016 and 2021. Grease retain its property at different temperatures during operations hence useful for machines that work intermittently. The transportation application dominated the lubricants market. 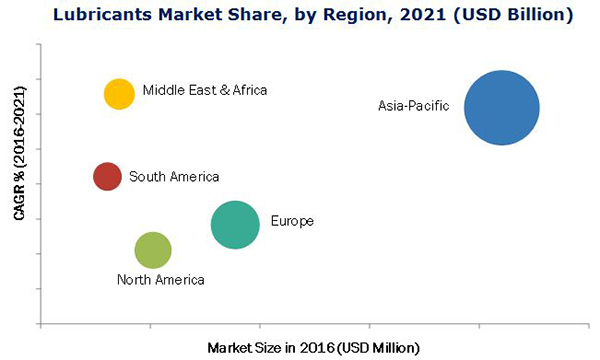 The increasing number of passenger vehicle, commercial vehicle, and growth in the aviation and marine industries are expected to drive the rising demand of lubricants, globally. In addition to this, the improved living standards in emerging economies are contributing to the growth of the global lubricants market. Currently, Asia-Pacific is the largest market for lubricants. The growing automotive and manufacturing industries in the region are expected to drive the increasing demand of lubricants. The Middle East & Africa is projected to be the fastest-growing market between 2016 and 2021. This high growth is attributed to the growing industrial sector in the region. Transportation accounts for more than 60% share of the global lubricants market. Smooth running of vehicles and long engine life entail consistent use of lubricants. Passenger vehicles, commercial vehicles, aviation, and marine are the sub segments of transportation. Passenger and commercial vehicles are the major consumers of lubricants. This is due to the rising vehicle production and improving standard of living in the developing nations. The aviation industry is fueling the market for high-quality lubricants. Moreover, the reduction in the trade barriers, bulk & cheap cargo transport through waterways are boosting the shipping industry which in-turn leads to the increased lubricants consumption. The varying temperatures and high friction during industrial processes make it essential to use lubricants. This material enables effective functioning of machineries and equipment. Use of lubricants helps to increase machine and equipment life. The demand from the industrial sector for lubricants is projected to be steady for the next five years. What are the upcoming product type of lubricants? The major factor restraining the growth of the lubricants market is increasing shift toward the high drain interval lubricants such as synthetic lubricants. The use of synthetic lubricants increases the drain out time and as a result the lubricants consumption decreases, hence the overall lubricants market shrinks. Moreover, the high cost of synthetic and bio-based lubricants decreases its consumption, which in turn reduces the market demand. The increasing popularity of hybrid electric vehicles may restrain the growth of the market in the next five years. Some of the important lubricants companies are Royal Dutch Shell Plc. (Netherlands), Exxon Mobil Corporation (U.S.), Petrochina Company Limited (China), Sinopec Limited (China), Total S.A. (France), Lukoil (Russia), BP Plc. (U.K.), Chevron Corporation (U.S.), Fuchs Petrolub AG (Germany), Idemitsu Kosan Co., Ltd. (Japan), and others. 11.2 Royal Dutch Shell PLC.